31 Days of Halloween: Pumpkin Party with Printables! Last year, I threw a Pumpkin Birthday Party for my newly 2 year old son. 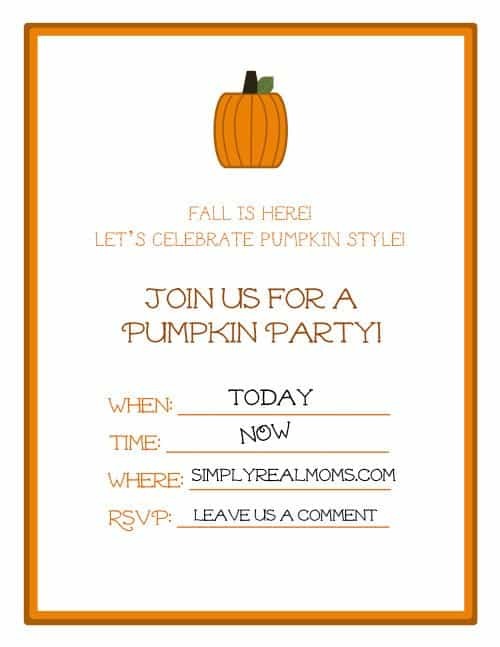 I LOVE that his birthday falls so close to Halloween…and we celebrated that with our very own fall/pumpkin themed party! Want to throw one too? Here’s the how to on EVERYTHING I did, and I’ll throw in some free printables for you too. I like to make a shirt for my son for his birthdays, so last year, I went with THIS technique, and made a shirt that simply said “I’m 2” with a jack o’lantern face on the back. Simple, yet a fun, custom way to celebrate your little one! Next, every party needs an invitation, right?! I got a little lazy about the invite and sent out an e-card. But for you?! 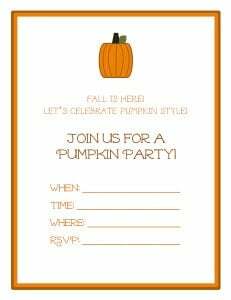 I made a nice printable invite for you to use for YOUR pumpkin party! 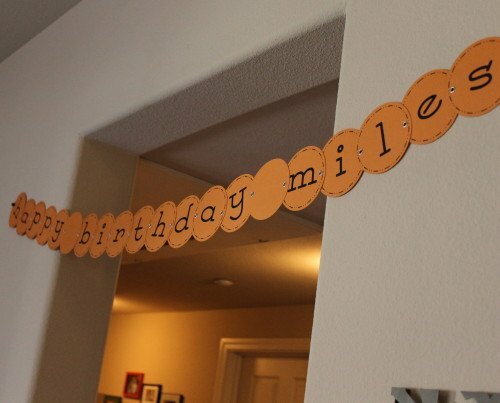 I made a simple banner that said “Happy Birthday Miles” as decoration. I made you two to choose from! 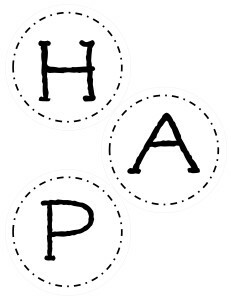 Print the image of your choice out onto the paper color of your choice (I used orange scrapbook paper), cut into circles just larger than the image, then I used a Crop-a-Dile to fasten them together. If you don’t have a Crop-a-dile, then simply punch holes and tie with ribbon. 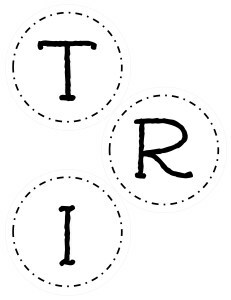 Don’t forget extra circles to go in between the words! I used thumb tacks through the end holes to hang it. What would a Pumpkin Party be without pumpkin cake? With all of the other things I did for the party, I needed the cake to be easy. So I used the easiest recipe EVER. try not to lick your computer screen. Mix the two cake ingredients together until you have a thick batter. Spoon half into a bundt pan sprayed with Pam and bake at 350 for 40 minutes. While the cake is baking, mix all three ingredients for the Cream Cheese Filling with an electric mixer for a minute or two, until combined well. Place into fridge. Once cake is done baking, take it out and let cool for 10 minutes, then flip it out onto a cooling rack. Smear the cream cheese filling onto the flat side of one, and place the second side on top, making a sort of pumkpin shape! 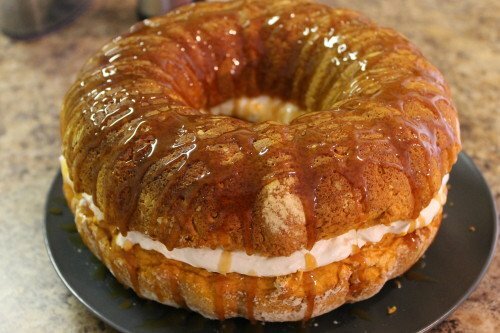 Drizzle the top of the cake with caramel ice cream topping and enjoy! 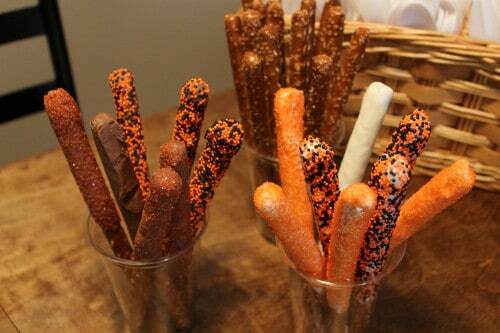 We love pretzels in our house! I mean, who doesn’t, right?! But for a party, they need a little jazzin’ up. All you need is Pretzel Rods, a little Almond Bark (found along with the chocolate chips in the baking aisle) or Chocolate chips. Buy in white and milk chocolate. I prefer the almond bark if you can get it because chocolate can be a little easier to burn if you aren’t careful. 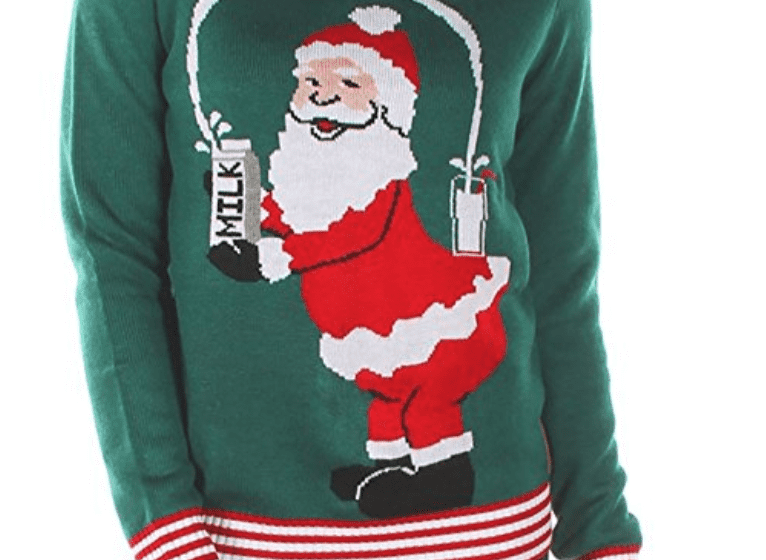 I know for sure Walmart carries it. Also, pick up sprinkles and colored sugar in the colors you want. Melt down the Almond Bark or chocolate in the microwave (or on the stove if you prefer) in 30 second intervals. Stir, then heat another 30 seconds, repeating until smooth. Using a spoon, coat your pretzel rod about halfway with the melty goodness, and tap off all of the excess chocolate that you can. Add the sprinkles or sugar while it is still wet, then lay onto some foil or wax paper to dry. I made about 20 of the rods, because half of the pretzels in the package were broken. Make sure to buy an extra bag of the rods. These were a hit! They look cute, and taste SO SO good! Use the same technique as the pretzel rods! 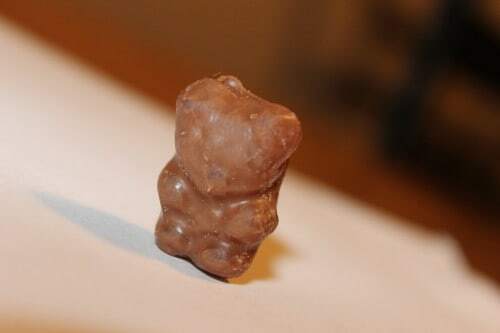 Using a fork, dip the Gummy Bears into the melted Chocolate or Almond Bark. Tap the fork along the side of the bowl until you can see the little features of your gummy. Lay it down onto wax paper or foil to dry. This is a longer process since they’re so small, but SO worth the effort! 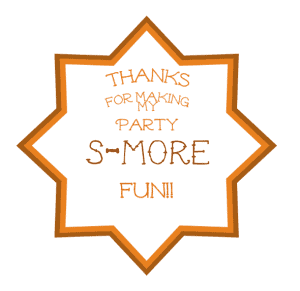 For favors, I made little S’mores to go! They are super easy for a busy mom to make, and look so cute! Choose from the following two for the favors of your choice! To print the tags- Click on the image for your choice of tag, and print it onto the paper of your choice. I used a textured ivory scrapbook paper. To cut them, I used a Large Circle Punch that I got from Michaels, but you are welcome to just cut them. 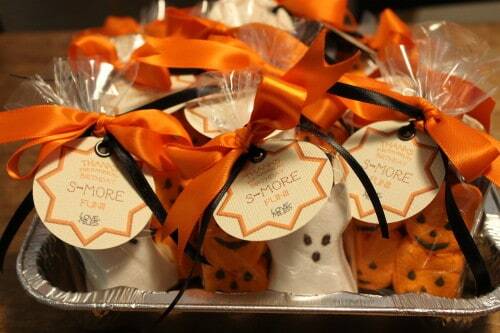 Punch a hole in the top of each so you can tie them onto your favors! For each bag, I placed 1 Cracker, broken in half. 2 Fun sized Hershey bars (you can also use half of a regular sized bar). Then 1 Ghost peep, and 2 pumpkin peeps. Tie your ribbon around the top, adding the tag halfway through tying. 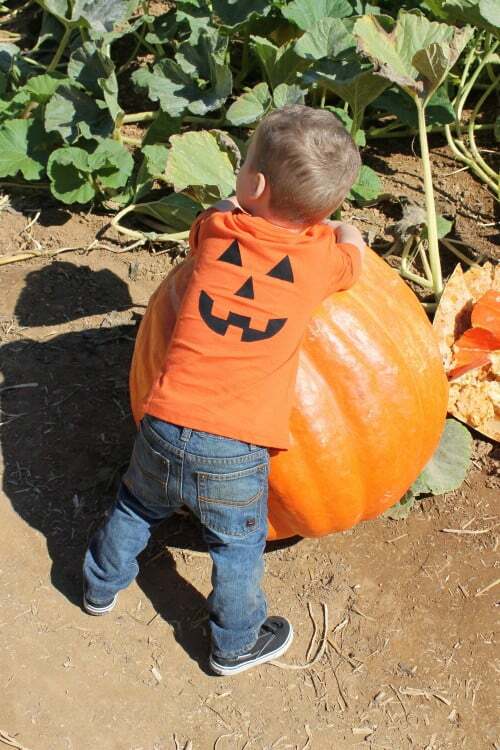 We had so much fun at out pumpkin party, took the kids to a local Pumpkin Patch, rode the hayride, pet some animals, picked out our pumpkins, then came home for a lovely meal and fun! 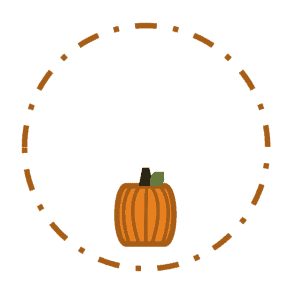 Hope you have fun at YOUR pumpkin party! I love this!!! We have 3 October Birthdays (all on the same day!) and my youngest just turned 2, too! 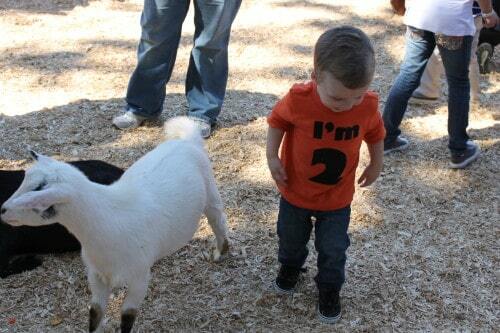 🙂 I love your little guy’s shirt!! !